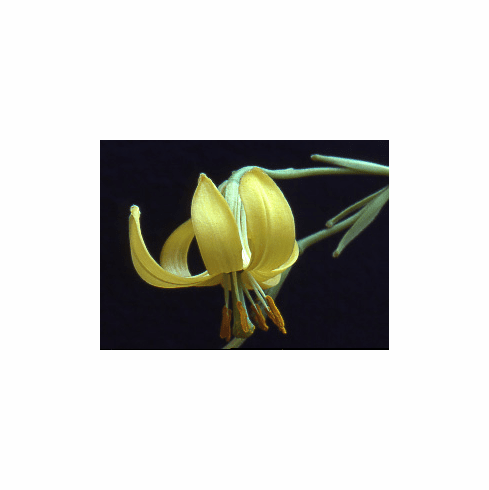 The yellow form of Lilium callosum , this dainty variant is found chiefly on the island of Okinawa. Easily grown from seed, it is not as long lived as the type. Our first seed of var. flaviflorum came from the prestigious Ofuna Botanical Garden, Japan. Years ago we were able to exchange seed of many of our North American species with Ofuna for the species of Japan. We found it easy to grow and flower in an unheated greenhouse, but to be difficult and short lived in the garden. Title photo of specimen flowered in cool greenhouse in 1986. Our "seed exchange" program with Ofuna started by sending seed of a few of our west coast natives as a gift with a request for seed of any Japanese natives they may have available. Within weeks, a very gracious letter from director, Akio Matsuo arrived with a packet full of small envelopes of native seed, greatly exceeding in numbers what we had sent. Being thankful, we sent more seed of species not previously sent expressing thanks, and a few weeks later, even more seed came back. Next, we sent seed of the eastern US natives, a few weeks later even more seed came back. We mentioned to a Japanese friend our exchange of seed and were feeling "guilty" that Ofuna had sent about 3 times the volume back and we had nothing new left, they had all of the US species now. She explained that "Japanese people are honor bound to return a gift with a greater gift and to now simply thank them for their generosity" which we did. She also told us stories of how when she was a little girl, the family would go up into the mountains to collect wild lilies to eat, being considered a delicacy. She would from time to time glean bulbs left in a field after harvest but when asked why she never took any of the trumpet bulbs, her reply was, "purple bulbs are bitter". Photo insert courtesy of Wikimedia Commons. Photo was taken by John Loganecker and is presented as the original on Wikimedia Commons. Thank you John for sharing this wonderful photo.